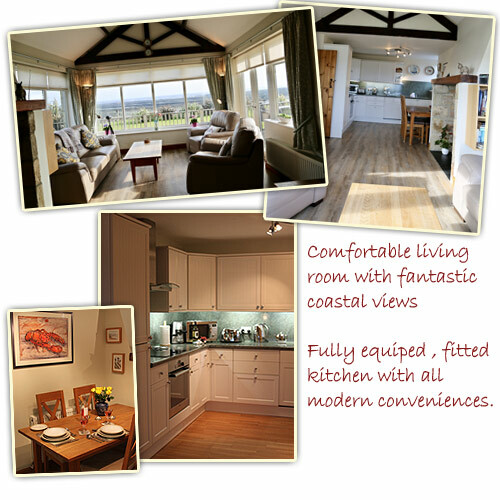 Coble Cottage has been built and furnished to a high standard and has both Visit Britain’s 4 Star standard & Gold Award Self Catering Holiday Accommodation. The cottage, a detached stone bungalow off the main road, with its own private parking and decked area is suitable for up to 4 persons and children of all ages, a cot and high chair can be provided on request. The cottage is also suitable for partially disabled persons and further information can be provided. One small well behaved pet is welcome by prior arrangement. The cottage has Kardean flooring throughout the living area and oak flooring throughout the bedrooms. There is oil central heating and a wood burning stove which can be used to supplement the heating if required. All the paintings and décor have been sourced locally and follow a ‘Seaside’ theme. The living area is open and contains a fully equipped fitted kitchen which includes oak dining table, fridge / freezer, filter coffee mchine, electric hob and oven, dishwasher, microwave and all the other items you would expect to find in your kitchen at home. Tea towels, dish cloths, washing up liquid and dishwasher tablets are all provided. The sitting area is surrounded by large picture windows looking directly out onto the beach and North Sea, a telescope is set up for you to watch the birds and passing boats. Flat screen TV including SKY & DVD, CD/radio and a Local interest books are there for your enjoyment, delve onto the book case for easy reading books which once started, you are welcome to take home to finish. There are also few games to pass the winter nights away. Super fast Wi-Fi internet access is available too. There are two bedrooms; one with a double bed and the other is a twin bedroom with single beds. Both rooms have built in wardrobes, bedside lights, en-suite shower rooms with heated towel rails, whb, wc, hairdryers and shaver points. 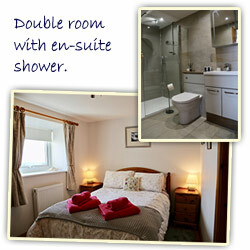 The en-suite in the twin room is a wet room. All the bed linen, both summer and winter weight duvets and pillows are hypo allergenic. Bath sheets, hand towels, and children’s beach towels, are provided. The entrance hall to the cottage doubles as a utility room and includes an automatic washer/dryer, iron and ironing board, full log basket, and a range of tourist information brochures. For your pet we provide a doggie basket which includes towels and throws so they can be comfortable too. Patio doors open from the living room onto a private decked area with patio furniture so you can take full advantage of the spectacular scenery. The garden, whilst it is not fenced is for your enjoyment and is a great place for children to play games or have picnics.